Drum roll, please... [insert rumbling snare sounds] - Announcing the Top 10 most visited pages on CoyoteMusic.com in September 2012! Thirty days hath September...and after those 30 days passed us by, Coyote Music was left with 10 pages that piqued the most people's interest throughout the month. 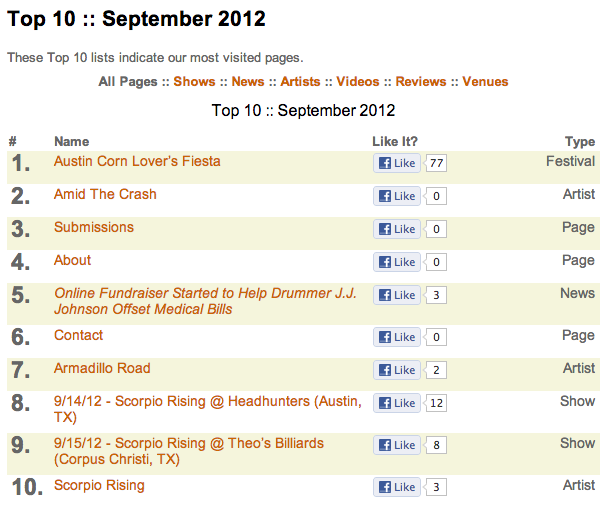 The Austin Corn Lover's Fiesta (aka "The Real ACL") took our top spot. It's an independent festival positioning itself directly against the mainstream mammoth that is Austin City Limits fest. Virtuoso musicians and Christian rockers Amid The Crash were just edged out of the top spot late in the month, but rumors of their working together on new songs certainly started a buzz. Our own Submissions, About, and Contact pages were 3, 4, and 6, respectively, with our post about drummer J.J. Johnson's online fundraiser coming in at #5. New Coyote Music artist Armadillo Road grabbed a lot of attention, due in large part to their September show at The Broken Spoke and Doug Moreland's 10th Annual Calfry hootenanny. Austin's energetic dance/rock mavens Scorpio Rising rounded out the Top 10, taking the 8, 9, and 10 spots with their September shows at Headhunters in Austin and Theo's Billiards in Corpus Christi, as well as their own Artist page solidifying the 10 spot. Take a spin around Coyote Music's site, find what you like, and share it with friends. Then next month we'll see how our Top 10 sorts itself out in October. Thanks for playin'. See you next time!